From traditionally handheld squeeze juicers to centrifugal juice extractors, there are a number of products on the market that claim to produce fruit and vegetable juices that taste great while preserving the maximum amount of nutrients from the fruit and vegetable fibers. A masticating juicer (commonly referred to as a cold press juicer) may be one of the newest products available, but these kitchen tools have already enjoyed a boom in popularity, with cold press restaurants and juice bars opening in various locations around the country. Masticating juicers work on a simple principle; they first crush, then press any fruits or vegetables placed in them, producing a fibrous juice drink. They’re referred to as “cold press” because their mechanical parts do not produce any heat during extraction. When heat is applied during the juicing process (such as that which occurs using a centrifugal juice extractor), nutrients are lost, and thus so are many health benefits of the juice. 2.2 2. What Will You Process? 2.3 3. What Are Your Desired Components? There are several factors to consider when attempting to choose a masticating juicer. First, you must decide whether you would prefer a single gear, single auger masticating juicer or a dual gear masticating juicer. A single gear, single auger masticating juicer uses one “drill bit” to crush and process juice (and only processes it one time). For a dual-stage masticating juicer, juice is processed and squeezed, then processed and squeezed again. This technique uses more of the fruit and vegetable and produces more juice from the original ingredients. Dual gear masticating juicers also tend to save on counter or storage space, rather than the typical single gear, single auger juicer which often have a large horizontal profile. 2. What Will You Process? When considering which type of masticating juicer you are planning on using, you’ll need to consider what your day-to-day usage of the juicer will usually be. If you typically only process fruits, a single gear, single auger juicer will be plenty of juicer for your needs. If you typically drink green juices, or you plan on making your own almond or cashew milk, the better option is to go with a dual-stage juicer. 3. What Are Your Desired Components? Next, look at what components you feel your new masticating juicer must have. If you want easy storage capability, consider a juicer that has a built-in storage jug that doesn’t require you to transfer any juice or milk you produce. Also, be sure to look at how much input will be required from you during the extracting process. Will you need to pause the process to empty the pulp tank, or can the juicer handle large amounts of waste? Will you need to continually press down on the items you’re juicing, or will the juicer continually feed fruits and vegetables into the extracting chambers? Choosing a masticating juicer that will meet your lifestyle and needs will help you narrow down your choices to the best fit. Finally, consider what additional features you’d like your juicer to have. Some dual gear juicers are capable of processing nut butter, grinding ingredients like coffee, or being used as a fine food processor with the purchase of additional attachments. You’ll also want to examine how easy the juicer is to clean, as a dirty juicer will lead to bitter or foul-tasting juice. As a last additional feature, you might want to give some consideration to whether noise level is important to you; some juicers are known for their quiet motor operation (a factor if you plan on using your juicer for long periods of time or on a daily basis). 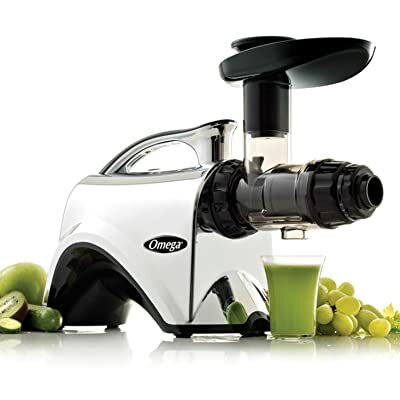 The Omega J8006 Dual-stage Masticating Juicer regularly ranks at the top of masticating juicers and for good reason; this juicer can handle all fruits and vegetables, but can also support various attachments for making nut butter or processing coffee, herbs, or pasta. The motor that drives the extracting process is powerful, and the Omega J8006 can handle just about any type of food you put into it. It comes standard with a number of accessories, but an even wider selection is available for purchase. If a matching kitchen is a priority for you, this juicer is available in a wide variety of colors. For those who are concerned with customer service or juicer longevity, this product comes with a fifteen-year warranty. Recommended For: Those who plan on juicing or processing a wide assortment of foods, as well as those interested in specifically processing nuts. 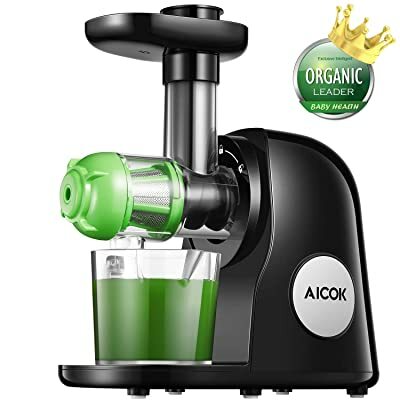 Aicok is a familiar name in the masticating juicer world, and the company has several different models available for purchase. This model, the 521 Juicer Queen, makes the list due to the fact that it’s made with food-grade safe material and uses a specially designed “seven spiral system”. This feature promises to get up to a 90% yield for some juices, maximizing the amount of juice you get from each vegetable or fruit, and producing what is known as a “dry pulp”. The motor is quiet compared to other models, and it is able to go into reverse; a feature that can help to unclog any stuck or particularly dense pulp. Since it is a single gear system, this juicer is not recommended for any “harder” foods, meaning you’ll want to limit yourself to juicing only fruits or softer vegetables. For customer service, this juicer comes with a two-year warranty offer, a notably shorter warranty than most other companies. Recommended For: Those who are interested in juicing, but who plan to stick to mostly fruits and some vegetables. 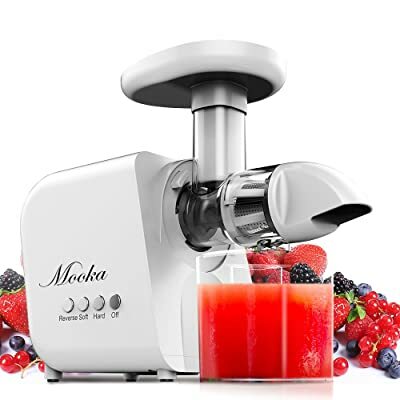 The Mooka Slow Masticating Juicer not only has a small counter footprint for those who need to save on counter space, but best of all it can easily handle soft fruits, hard vegetables, and leafy greens through selection of the “hard” mode of juicing. All the parts are detachable for easy cleaning, although it is not advertised as dishwasher safe and should only be handwashed. It does come backed by a ten-year warranty for the motor, but only a three-year warranty for other parts. This hardy juicer makes this due to its workhorse abilities and it’s small size. Recommended For: Those who want to process both fruits and vegetables, but don’t require extraneous features or have space limitations. 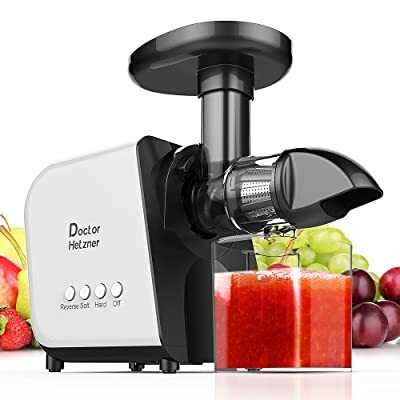 The Doctor Hetzner Juicer can handle any and all fruits and vegetables through its selectable hard/soft modes, and has a reverse mode to help with any potential clogged pulp. The pieces easily detach from the juicer making it extremely easy to break down and clean, but the parts are advertised as handwash only and cannot be placed in the dishwasher. The specialized long spiral processing system is what really makes this model stand out from other juicers; it works to produce a higher yield of juice, and leaves a dryer pulp to minimize the waste. 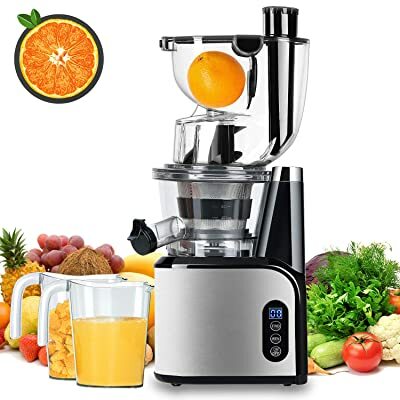 If you’re looking for a juicer to produce baby food with, this is also an excellent choice: all the pieces of the juicer are made with baby food grade safe materials. Recommended For: Anyone looking for juicing capability, as well as the ability to make baby food. 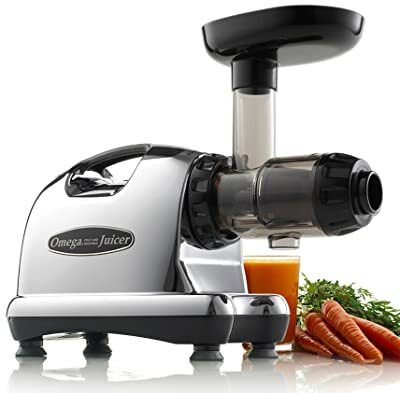 Another Omega Juicer, the NC900HDC is included on this list due to its excellent attachment availability, quick processing speeds, as well as the inclusion of an adjustable five-speed setting. It is able to process any and all fruits and vegetables, and it does it extremely efficiently. It’s the best option for those looking to process large amounts of fruits or vegetables, as it perfectly streamlines the extraction process with a wide chute and automatic pulp ejection. Recommended For: Serious juicers who are interested in making almond or soy milk, or nut butter, as well as those looking to make large amounts of juice. 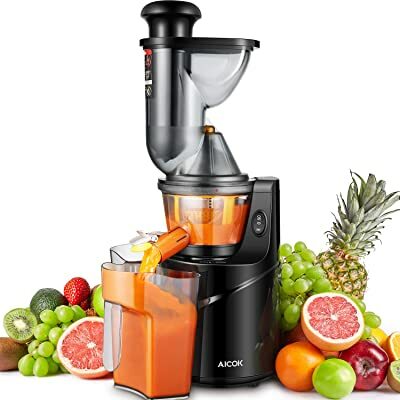 The Aicok Masticating Juicer has a quiet motor, and is able to easily process fruits and soft vegetables. It is a single gear, single auger juicer, and therefore it is not recommended for nuts or extremely dense foods. Backed by a three-year warranty, this Aicok model was chosen for the list because it truly stands out in the noise department. The juicer has specific design features built-in that reduce noise and vibration to ensure a very quiet juicing experience. Recommended For: Fruit and soft vegetable juicers whose chief concern is noise level. 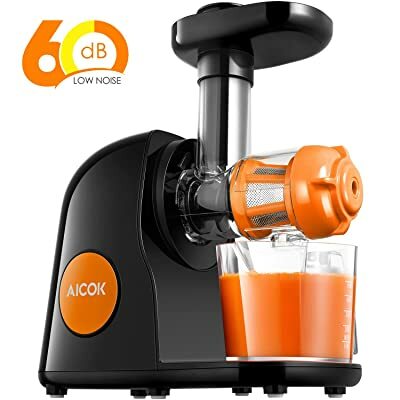 The Aicok Upright Masticating Juicer has many of the features of its brother and sister models, but with a compact, upright design that means the juicer takes up very little counter and cabinet space. With an extra wide mouth, and a built-in storage pitcher, this masticating juicer is a great option for those who are looking to process a large amount of fruits or vegetables and store the juice for several days. It was chosen due to being the complete package in a juicer; not only does it make processing and storage efficient, but it can process any fruits and vegetables and takes up very little counter or cabinet real estate. Recommended For: Those looking to process large amounts of fruit and vegetables who have limited counter or cabinet space, and who don’t require any extra features. The final masticating juicer on our list, the Aaobosi Wide Chute Masticating Juicer comes with both a wide mouth for large fruits, and a small mouth for skinny vegetables. This dual option is the reason this juicer is considered one of the eight best; the ability to choose a wide mouth or skinny mouth greatly cuts down on the time required to prepare food for juicing by eliminating any chopping that might need to be done. This model is made with food grade Tritan material, but only comes with a two-year warranty. Recommended For: Those who are short on time and don’t want to prepare fruits and vegetables prior to juicing. Whether you choose a single gear, single auger juicer, or a dual-process upright juicer, there’s certain to be a masticating juicer on the market that will meet all your fruit, vegetable and nut processing needs. By examining what you plan to use the juicer for, as well as what additional features you desire, you can narrow down the list and find the best masticating juicer for you and for your family. Question: How does a masticating juicer differ from other types of juicers? Masticating juicers use a slower spinning auger (which works on a similar principle to a drill bit), which crushes any products placed inside and produces juice. The design of the masticating juicer prevents heat from building up and destroying essential nutrients in the fruit and vegetable juice. Centrifugal juice extractors use high speed blades to process fruits and vegetables, which creates heat. Question: Can a masticating juicer process leafy greens? Absolutely. Masticating juicers are often used to produce green juices, or those juices that feature a number of green and leafy vegetables. Question: Can a masticating juicer be used with nuts? Yes, nuts can be placed in a masticating juicer to create almond or other nut milks. Question: Is a masticating juicer loud? The masticating juicer does create some noise, but because the process does not use high-speed components, the noise is typically less than a food processor or blender.